Thanks for stopping by and for all your wonderful comments. I'm honored to have you here and I truly appreciate each of you more than you know! Create a twisted easel card base from Pear Pizzazz card by following the instructions in this post. Stamp the spatter image from Gorgeous Grunge onto both Whisper White squares in Pear Pizzazz and Old Olive inks and attach one to the inside of the easel. Stamp the "Sharing in the joy..." sentiment from the stamp set in Old Olive ink onto a snippet of Whisper White. Die cut with the smallest Labels Collection die. 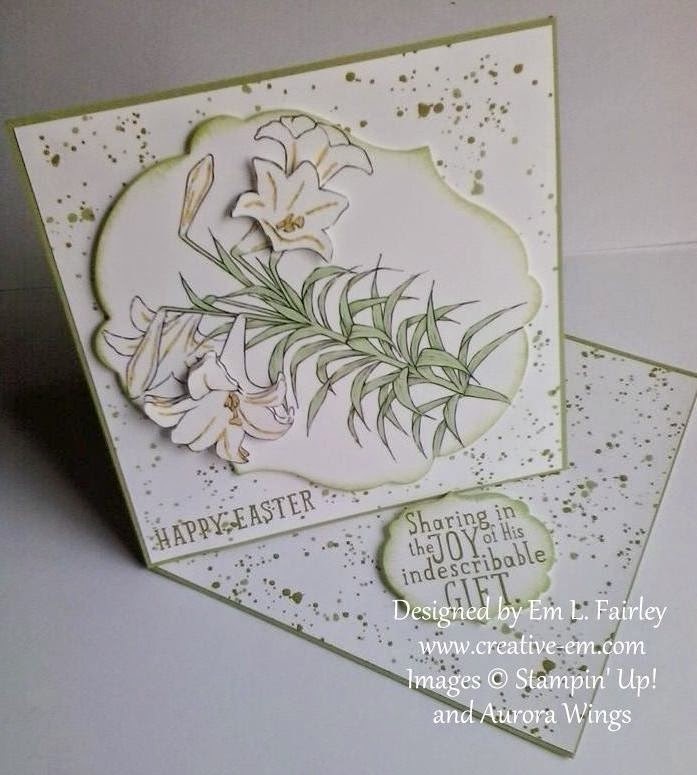 On the other, stamp the "Happy Easter" sentiment from Indescribable Gift in the lower left corner and add the panel to the easel topper. Print the image twice and color one and a few flowers from the other with Blendabilities. Fussy cut the flowers from the second image. Cut the complete image with the largest Labels Collection die and sponge Pear Pizzazz ink around the edges of that and the sentiment. Attach the printed panel to the topper and pop the cut flowers onto the image with Stampin' Dimensionals. Complete the card by adding the sentiment stopper inside with a couple dimensionals. All the products I've used for today's creation are available 24/7 in my Online Shop. Click the images below to be taken straight to them. I wish each and every one of you all the blessings that this most holy of days as we celebrate Jesus' resurrection, brings. I'll be back tomorrow with another creation, so I hope you'll join me then. Labels: 613 Avenue Create, Blendabilities, easel, Gorgeous Grunge, Indescribable Gift, Labels Collection Framelits, Stampin' Up! Gorgeous card, love the subtle colours. This image teams up with Gorgeous Grunge so well - super card! Happy Easter and I just love the card! Wonderful twisted easel card. TFS and Happy Easter. 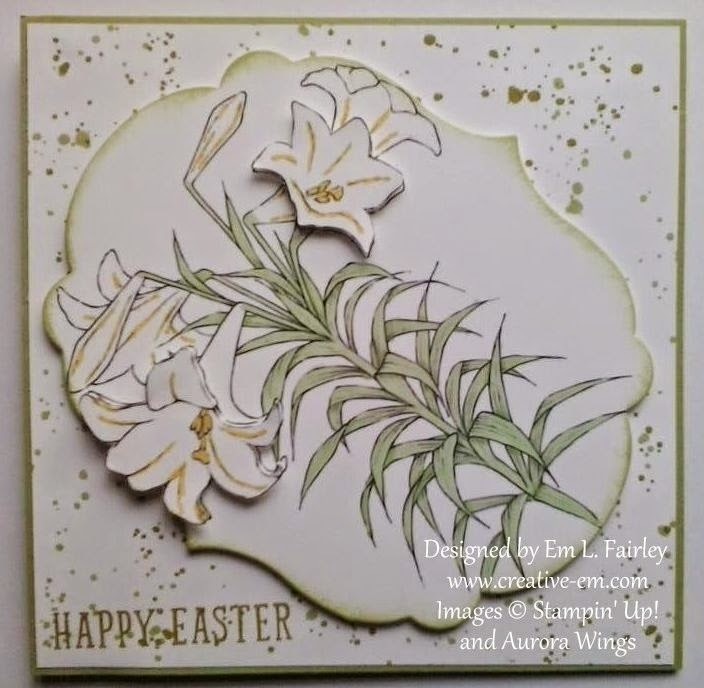 What a beautiful Easter card, EM - just love that type of flower. I also love the depth you added by popping us some of the flowers. Thank you for joining us in the Through The Craft Room Door challenge this week. Thanks so much for linking up and playing along at AAA Cards. Beautiful Easter card. Love the lily. Thanks so much for playing along with us at AAA Cards! Thanks for joining 3 Girl JAM challenge...but, the only requirement we have is that you must use a ribbon. I love to read your comments. Thanks for taking time to leave them! Contact via email for pricing information. Blog design by MHKDesigns by Mynn. All content is © Creative-Em.com. Simple theme. Powered by Blogger.